Sampling Enceladus: Is Earth Ready for Pieces of Saturn Moon's Plumes? The plumes of Saturn's moon Enceladus, as seen by NASA's Cassini probe in 2009. Many astrobiologists are champing at the bit to bring back samples from Saturn's ocean-harboring moon Enceladus, but others say it may be best to exercise a little patience. In 2005, NASA's Cassini spacecraft discovered that geysers blast from Enceladus' south polar region, sending material from the ice-covered moon's subsurface ocean far out into space. It's tempting to grab samples from Enceladus' plume and return them to labs on Earth for analysis as soon as possible, but a slower, more methodical plan may be the right way to assess the moon's life-hosting potential, one prominent space scientist says. "These are very hard decisions for decision makers to make when there are a lot of zeros after the dollar signs," added Sherwood, who manages the Innovation Foundry, which pulls together the conception, capture, planning and engineering of JPL space science missions. 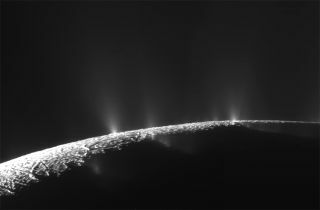 Enceladus has an extensive water ocean under its icy crust, feeding water jets that emerge from near the south pole. See how Enceladus works, and how its water geysers erupt, in this Space.com infographic. The 310-mile-wide (500 kilometers) Enceladus is one of the solar system's best bets to host alien life, researchers say. The satellite harbors large amounts of subsurface liquid water and also features an energy source: internal heat generated by the gravitational tug of Saturn. Other worlds throughout the solar system — such as Jupiter moons Europa, Ganymede and Callisto, as well as the dwarf planet Ceres — are known or suspected to host underground oceans. NASA has already taken an intriguing first look at many of these worlds, thanks to the Voyager, Galileo, Cassini and Dawn missions, among others. The best way to do all of this is to establish a step-by-step exploration program for the ocean worlds similar to the one NASA has developed for Mars, Sherwood argued. "A lot of money has flowed into the prospect that Mars is habitable," he said. But it's still preferable to conduct a detailed analysis of Enceladus' plumes in situ before mounting a sample-return mission, Sherwood said. Although Cassini has flown through the plumes and analyzed their components, the spacecraft wasn't designed with this task in mind. Protecting Earth against potential alien contamination would be a significant issue, Sherwood added. "You've got to demonstrate that you've got the means for planetary protection because you're bringing stuff back," he said. Despite decades of in-depth study, no samples have been brought back to Earth from Mars, though NASA's Mars 2020 rover mission plans to cache material to return in the future. Sherwood said achieving a sample-return mission to Enceladus requires step-by-step preparation. Given the estimated 14-year round trip such a mission would endure, not to mention the time spent developing missions, having a sample back on Earth by 2049 requires scientists to begin advocating today. "A lot of scientists say, 'No, I don't want to wait that long because I'm not going to live that long," Sherwood said. "If you never get started, it takes infinitely long." Every 10 years, the U.S. National Research Council's Decadal Survey looks into the future another decade to prioritize research areas, observations and potential missions. The next decadal survey will be published in 2021 and will affect decisions made in 2023. The survey is influenced by concepts submitted between 2018 and 2020, and has a September 2019 deadline. This gives scientists a short period of time to influence the next era of discovery. "We live in a pivotal time," Sherwood said. "One hundred years ago, no one could have imagined us doing the kind of exploration we're doing today." Follow Nola Taylor Redd on Twitter @NolaTRedd. Follow us @Spacedotcom, Facebook or Google+. Originally published on Space.com.